On the 5th Sunday after Epiphany, the lectionary skips forward to a new chapter. Maybe they were aiming to keep Jesus from a tiny bit of embarrassment: Luke 4:31-44 recorded the wonders Jesus did in Capernaum, which back in 4:23 he seemed to say were already in the past. Jesus is miraculously conceived and born as God’s own son. Jesus is baptized, and there God proclaimed him the incarnation of the 2nd Person of the Trinity. Jesus quietly proves his power by defeating Satan’s temptations in the wilderness. Jesus begins his public ministry, proclaiming himself the promised Messiah, provoking his home town congregation into a murderous rage. Jesus goes to Capernaum and does a series of miracles proving his call as Messiah. And now, with everyone’s attention firmly fixed on him, he begins to call his disciples. On the seashore with a large crowd waiting to hear him teach, Jesus steps into Simon Peter’s boat. 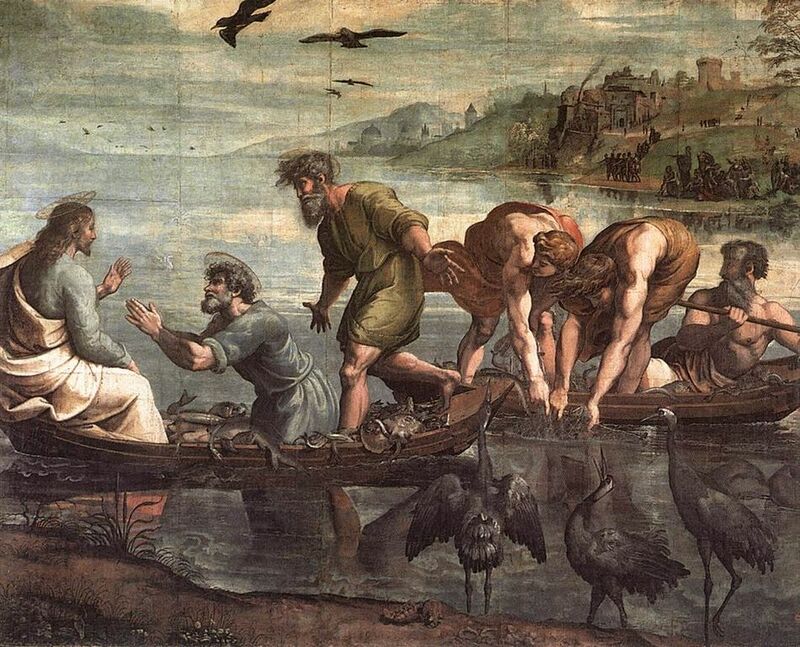 When class is over, Jesus tells Simon where to cast his nets, and he pulls in a big catch, which James and John help bring to shore. Simon is so blown away that he bows down before Jesus, confessing his sinfulness. Jesus turns the tables on him, proclaiming that Peter will stop fishing for fish and start catching people. The interest, I find, is in the little details. Some clarify points of fact and others take us to meanings worth weighing heavily. After a half-jillion readings of this passage, today I finally noticed a crucial detail here. You always seem to see Peter, James, and John together in the Gospels — like at the transfiguration, or in the Garden of Gethsemane. I think I assumed they just became close friends with each other because they all spent so much time together following Jesus. Luke tells us that it actually worked the other way around. They didn’t just happen to be in the same line of work, all fishing the waters of Galilee. My second little detail is about the context — Jesus’ demanding ministry. Mark is much more prone than Luke to show how enormously popular Jesus was. In Mark, heaps and gobs of people came to him, even figuring out where he was going next to get there before he did. Jesus seems to have taught, healed, fed, and otherwise cared for each of them and all of them till he has to go up the mountain for prayer and solitude. Here in Luke we get fewer hints of that overwhelming quality of Jesus’ popularity. But it is there in this passage. Picture Jesus on the lakeshore. People start to gather. More people come. The beach is full. Jesus is surrounded. They are pressing him closer and closer to the water. How’s he supposed to survive, much less teach them all? Well, as timing would have it, Simon Peter and his business partners have finished their night of fishing and they are on the shore cleaning their nets. Jesus steps into Simon’s boat and convinces him to push off a bit. Voila! Jesus is safe from the crushing crowd, and he has also turned the lake and shore into a sort of natural amphitheater. Takeaway: Jesus, even before he had disciples, was becoming enormously popular. And quite clever. The moment I find most evocative happens when the teaching is done and the crowd has cleared. Jesus is ready to turn his attention to Simon and his friends. What does he say? After all, when they put down the nets, they filled up till they almost burst, till the boats almost sank. Very dramatic. The miraculous catch matches our modern focus on measurable results, and Simon’s call matches up with both our individualism and our sense of mission. But it all depended on that first little phrase. We can’t live in the shallows. Our comfortable ways of worship and the unchanging day-to-day lives we think of as faith aren’t going to get us to the place where we can put the nets down, fill them up miraculously, and become fishers of people. We need to find our way into lives of depth — connecting in deeper ways with Christ himself, rather than just filling our Christian lives with busyness. We need to find ways to reflect more deeply on who we are, and how we are responding to our lives and callings. We need find deeper ways to bring all we are to Christ, to be healed, and changed, and sent. That’s what happened to Simon. The professional fisherman took the advice of Jesus, the apparent amateur, and set out for the deep water. What happened in the deep water stunned him into the deepest response of his life. He was so struck by the contrast between his own heart and this mysterious Jesus who stood before him that he tried to send him away. Because Simon had begun to go out into the deep water, to live in the depths, Jesus could work with him. Jesus smiled at Simon’s attempt to drive him away. No, Simon, don’t go away. This honesty is a great starting place. Leave the nets behind. I’ve got work for you to do. Finally comes the most surprising bit. Peter, James, and John had just pulled in two boats full of fish — boats so full they almost sank under the weight. It was the biggest catch of their lives. And then they just left with Jesus. They abandoned it all on the shore — nets, boats, and a whole, er, boatload of fish. What do you suppose happened to all those fish? There’s no better way to start living in the depths with Jesus than to work on deepening your prayer life. My annual lenten prayer class will open for registration soon. If you want me to let you know when it opens up, click on this button and get on the waiting list!